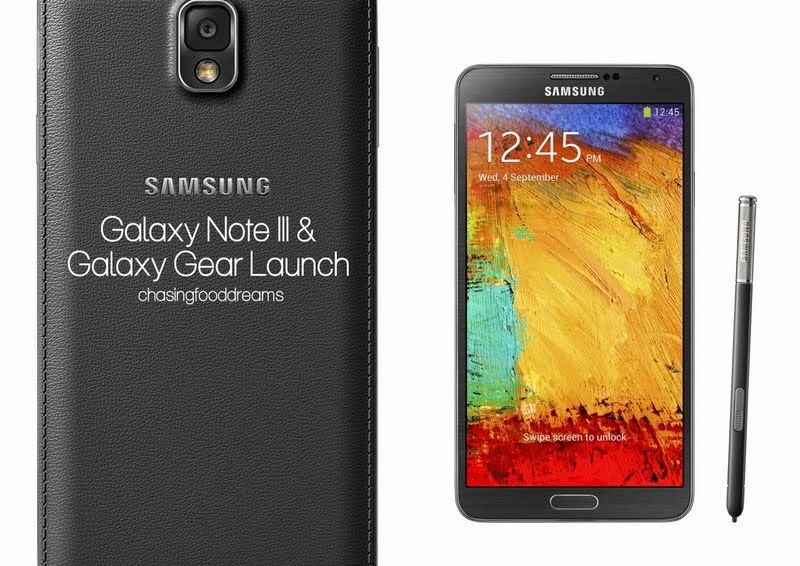 CHASING FOOD DREAMS: Samsung GALAXY Note 3 & GALAXY Gear Launch: Design Your Life! Samsung GALAXY Note 3 & GALAXY Gear Launch: Design Your Life! It’s here! Samsung Malaysia Electronics launched the GALAXY Note 3, the third generation of its successful GALAXY Note series and GALAXY Gear on 20 Sept, 2013 at the Sunway Convention Center. The event was exclusive for partners, media and bloggers. It was an honor to be the first to check out the latest GALAXY Note 3 and the innovative GALAXY Gear, a wearable device that is set to enhance the Samsung GALAXY experience. The event started off with a speech by Samsung Malaysia Electronics Managing Director, Mr. Kwon Jae-Hoon. “With the launch of Samsung GALAXY Note 3 and GALAXY Gear, we are proud to set a new benchmark of innovation in the large screen mobile and wearable device category. Samsung’s ongoing smart device leadership reflects our commitment to listen to our consumers, who want their daily lives to be easier and more enjoyable. The devices enable users to tell the stories of their lives through dynamic and seamless expressions of their passions across work, play and life experiences. “Samsung GALAXY Gear benefits consumers by integrating smart device technology even deeper into their everyday lives, and bridges the gap between the mobile device and fashion worlds to create truly wearable technology” Mr. Kwon added. The Samsung Product Team provided a deeper insight to Samsung GALAXY Note 3 and GALAXY Gear together with some videos. Catch one with lots of details in a nutshell here! Here’s a list of the applications that come with the Samsung GALAXY Note 3. GALAXY Gear is available in 6 colors. Here’s a digital short film ‘Dreams’ by Samsung on how a girl makes her grandfather’ old toy store more amazing with the Samsung GALAXY Note 3 and GALAXY Gear! After the launch, we head over to the Samsung booths to check out both smartphone and device. Flaunt by models and Samsung ambassadors, everyone had plenty of opportunity to play with the Samsung GALAXY Note 3 and GALAXY Gear. The 5.7-inch Full HD Super AMOLED screen offers users a brilliant viewing experience but this also means that the GALAXY Note 3 is bigger in size. Depending on the users, the GALAXY Note 3 fit perfectly in my big hand since it is quite slim in depth. I have a nice grip on the phone and the 5.7 inch screen is perfect for me since I prefer to catch a bigger view. There is also a longer lasting battery life and a 13 megapixel rear camera. There are many new improved functions like the new S Pen button offering more functions like Air Command, new S Note, new Easy Clip feature, Multi Window function and more. The GALAXY Gear too offers many functions that gives users smart freedom to choose how, why, when and where they are connected. GALAXY Gear will notify users and give them quick previews of incoming texts, emails and more coming from GALAXY Note 3. It has a range of other valuable features and commands that extend the GALAXY Note 3 experience. When an incoming message requires more than a quick glance, users can simply pick up their Samsung GALAXY devices and the Smart Relay feature will automatically reveal the full content on the screen. Did you also know that the Samsung GALAXY Note 3 comes with a soft and textured-touch back cover finished with delicate stitching? I love this personalized touch! 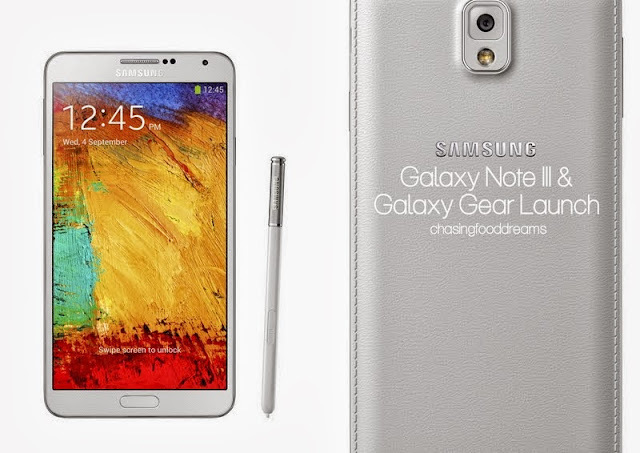 Samsung GALAXY Note 3 will be available in Jet Black and Classic White. The Samsung GALAXY Note 3 and GALAXY Gear will be available at all Samsung retail outlets, authorised dealers and telco partners including Celcom, Digi, Maxis, and U Mobile.